I did a post recently that showed some scans of a Corgi Catalogue – http://www.thoseweleftbehind.co.uk/2009/11/old-cataloguescorgi-toy-catalogue-page.html – and now here is another set of scans, from 1973. Some lovely stuff here – Basil Brush! Noddy! Daktari! Batman! And loads of cool beach buggies! Taken from prog 171 (2nd August 1980). 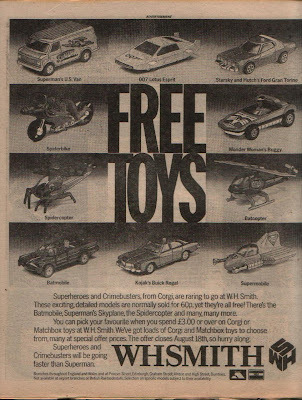 A promotion for Corgi and Matchbox toy cars – spend more than £3.00 and you got the choice of some great vehicles…..check them out. Did Superman really have a van?